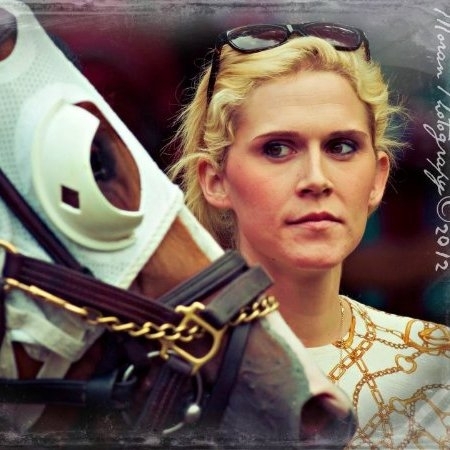 Home > People You Should Know in Racing > Abigail Adsit: Thoroughbred Trainer on the Rise. 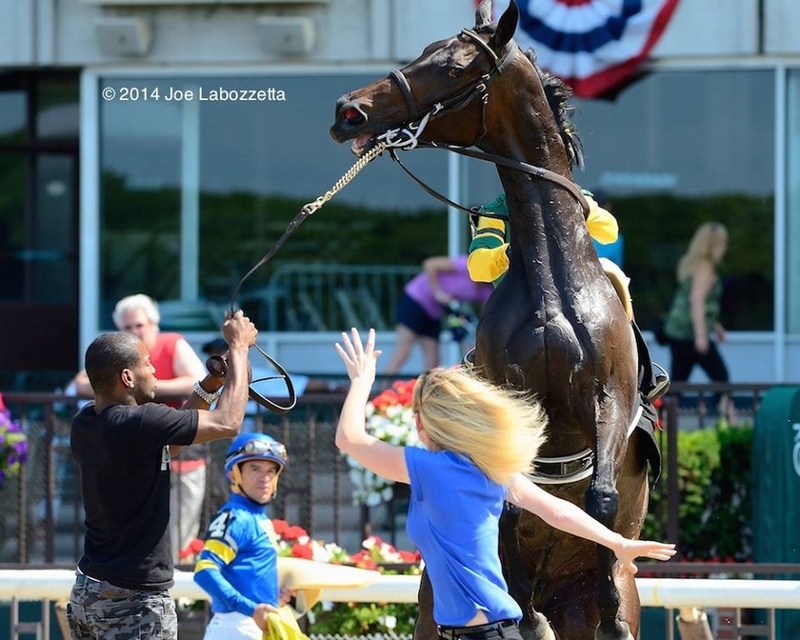 Abigail Adsit: Thoroughbred Trainer on the Rise. The Saratoga 2014 meet is upon us, and I am always in awe of the hundreds–thousands–of people who roll into town with the horses. 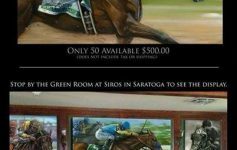 NYRA (the New York Racing Association) is a gigantic corporation that efficiently picks up stakes and moves their entire operation north for seven weeks every year. The fact that NYRA employees all along the line can pack and unpack thousands of boxes of computers, paperwork, office supplies and technology in a matter of days, and be ready to kick off the greatest racing in, well, the world–is nothing short of miraculous. But the administrative offices and those who work there are not the entire story. Trainers, jockeys, exercise riders, grooms, hotwalkers, clockers and every other person who works directly with the horses, themselves, likewise move their entire lives for the seven sweet weeks of our race meet. I’m not even going to pretend to write this objectively. I’m not that good a writer, that I could convince you that I just met Abigail Adsit and thought that she’d make a good story. Abigail is a friend, but more like a niece to me. I am so proud of her: This Just In: Her stats for the Belmont Spring/Summer meet: 30% win, 60% in the money (win, place or show). Wow. My reaction to meeting Abigail last summer was that I’d met a long-lost and treasured relative. I’d known her parents for several years, only to say Hi in the Saratoga backstretch. Jean Blocker Castleberry Adsit and Eric Adsit also are magnets. When first I met them, I didn’t know if they were (horse) owners–trainers–but there was something special about them. Jeannie emanates elegance and genuine Texas charm. Not the kind of “charm” that’s necessary to be a Ponzi schemer: REAL charm, the element that separated Jacqueline Bouvier from her classmates at Vassar, and George Washington. Style. And Eric–his warm smile and sharp wit can win over the ugliest of hearts. Apples don’t fall far from their trees, as you know–so when the Adsits told me last summer that they wanted me to meet their daughter, the horse trainer–I knew that I was in for a treat. Abigail is warm, kind, intellectually brilliant–and ferociously, adamantly a lover and defender of horses. First and foremost, she is a horsewoman. 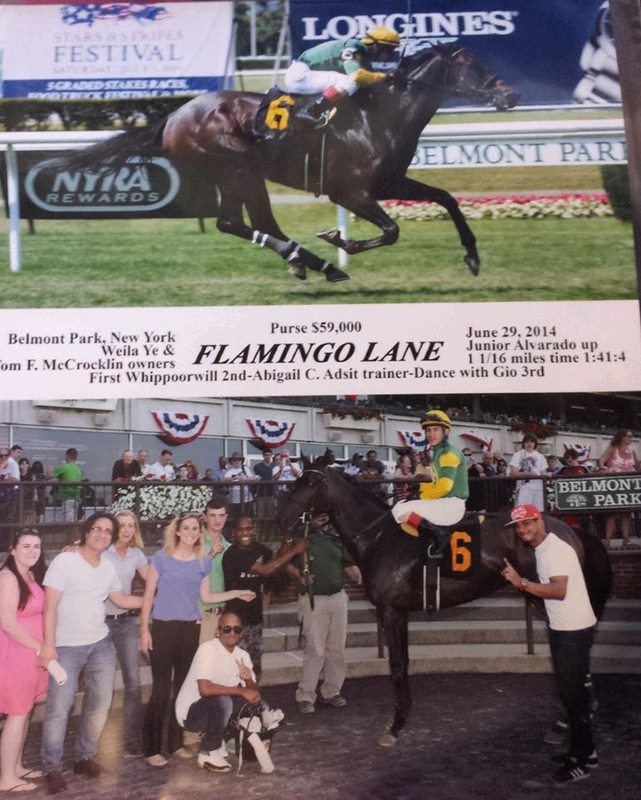 During Belmont Stakes Week,she adopted a pony who was close to being starved to death and was headed to slaughter. Abigail wouldn’t stand for that, so Sassy, as Abigail named her, went to live with Abigail (and some other adorable animals behind the Belmont barn shared by Trainer, Bruce Brown and Abigail.) Spending time with their precious collection of pony–bunnies and fluffy chickens during the hectic Belmont Stakes Week calmed my ravaged nerves and reminded me to Keep it Real. rider, instructor, exercise rider and assistant trainer. (At age eight or nine, she was the youngest licensed polo groom in New York State.) In 2009, she earned a Baccalaureate from the prestigious Union College, while exercise riding for outstanding Trainers Todd Pletcher, Wesley Ward and Rick Violette. From there, her path took her to the barns of leading Trainer, Linda Rice, as Rice’s assistant. 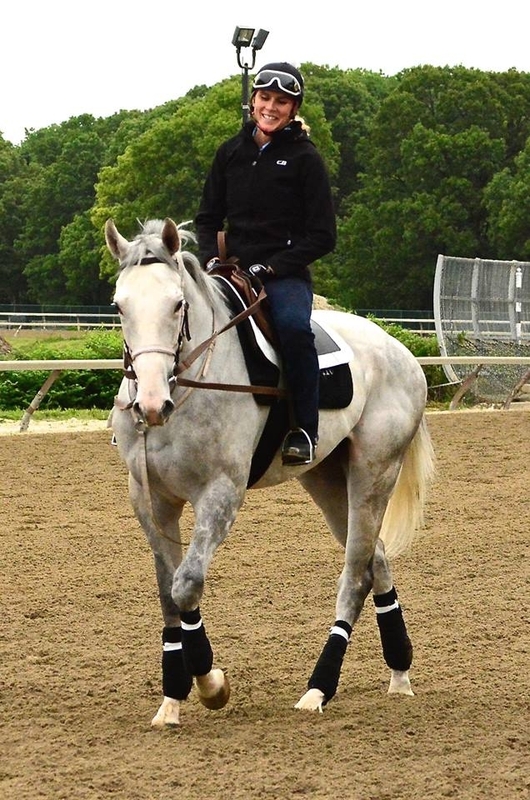 Finally she gave in to her dreams and the urging of many horse owners and racing insiders: she secured her New York State Trainers’ license and opened shop in January of 2013. Giant Indian and Miss Mexique gave her first victories. Beautiful Belmont Park became her home, and that of the horses who’d been entrusted to her. This Spring Belmont meet has brought Abigail to the attention of many potential owners. Recently, she won twice within three days with the gorgeous Lavender Road and Flamingo Lane. Her deep love and understanding of the Thoroughbred–conformation, pedigree and that indefinable “something”–provide valuable bloodstock advice for her clients. She’s savvy in business affairs, always looking out for the best for those with- and for- whom she works. 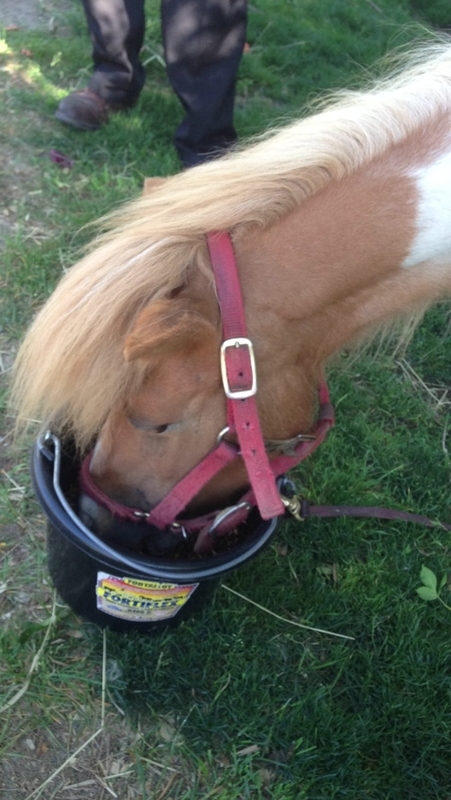 Always putting the health and welfare of the horses in her care first is her mantra. Clients know that their horses are in the best, most capable and most caring hands possible, for every horse is treated as if s/he is Abigail’s own. some very promising steeds in her care, including those belonging to an exciting new partnership, On the Rise Racing. But her heart and her barn still have room for more horses, and new owners who want to hitch their star to a future Hall of Famer. new ethos and moral grounding that will benefit everyone concerned, horses and humans, alike. Horse racing is being assaulted at every turn, it seems–and yes, the sport in America has a lot to fix. But we should be encouraged that young Trainers like Abigail are in our corner–in our New York racing community, and beyond. With devoted horse lovers like her roaring to the forefront, the future of horse racing looks much brighter than the naysayers wish. What’s good for The Horse is good for horse racing–and Abigail Adsit and her contemporaries indeed are very good for The Horse. Previous Article To Grow Horse Racing, Feel Like a Child: Pure, Obsessive Joy. Next Article Muck Dynasty: 1 and 1a Provide Hillbilly “Charm”–and the Recipe for Tarnished Chrome. 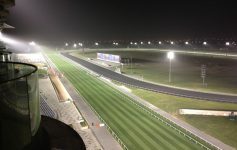 AmDubai Racing Stable: Abstract Thinking + Horse Sense = Racing’s Best Plan for the Future. 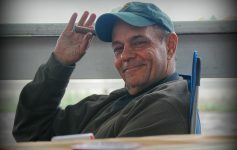 Ode to a Horseman: Lenny DeVito, You’re in Our Hearts. And the Winner’s Circle.